This latest edition of the week in mixes features sets from some of our favourite producers of 2013, alongside some interesting curiosities and historical house classics. 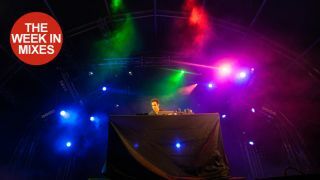 Another week, another fine set courtesy of Four Tet. This one is an hour-long live set recorded earlier this week in Tokyo, showcasing Kieran Hebden's impressive performance skills, and tracks from his fantastic recent album Beautiful Rewind. The latest XLR8R mix comes courtesy of German electronic icon DJ Koze, the man behind one of the finest dance albums of this year. It's a brilliantly eccentric set, which sees Koze dropping a version of Marvin Gaye's Sexual Healing alongside a health dose of melodic house and techno. The raison d'être of blog-come-record label Awesome Tapes From Africa is pretty self-explanatory. This set, recorded last month for New York radio show Beats In Space, sees them living up to their name. London-based producer and DJ Bob Bhamra (aka West Norwood Cassette Library) is something of a house music connoisseur, as he demonstrates on this history lesson mix for Dummy. The mix is sequenced in chronological order, acting as a guided tour through house music from the late-'80s right up to the present day. Dutch techno favourite Boris Bunnick steps up to provide the latest RA podcast under his dancefloor-focused Conforce alias. The result is an hour long session of moody techno, club-friendly house and moments lively electro, all mixed together impeccably.